The developer for Ginn sur Mer is Ginn Clubs & Resorts owned by the Ginn Company. With billions in annual sales and thousands of satisfied owners and members, the Ginn Company has earned a reputation as one of North America's foremost developers and operators of vacation destinations. Ginn has created a unique formula for creating resorts. 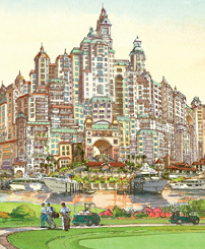 The company designs its resorts to operate like exclusive clubs. 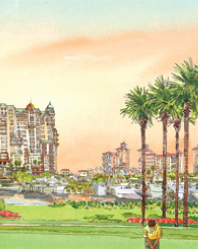 Its strategy is to purchase raw land, develop it into a five-star quality resort and residential community, and then manages it once it is up and running. This hands-on approach is integral to the Ginn philosophy. Ginn stays involved in all projects from initial conception through their day-to-day operations. And this is the company's stated strategy for Ginn sur Mer. 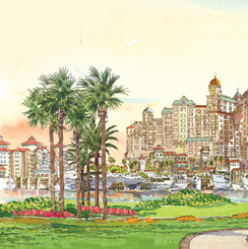 Ginn Clubs & Resorts will not only be involved in the 10-year build-out of the resort; it will forever remain integral to every aspect of the resort's operations. Over the years, Ginn has become a well-respected brand name on par in quality with Ritz-Carlton, Trump and Starwood. 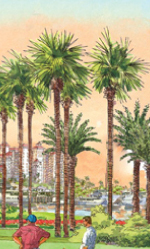 It is considered one of the largest resort community and real estate developers in the Southeastern United States, with additional communities under development in Colorado and the U.S. Virgin Islands. It currently has over 30,000 acres in development and more than 3,000 employees. Ginn Company sells roughly $2 billion in real estate each year. The firm is backed by the Adlers Group, a respected and well-known financial institution in the world of international business. Ginn Clubs & Resorts is committed to carrying out the development of Ginn sur Mer within the best environmental, engineering, architectural and landscaping guidelines. The distinctively Bahamian features of the resort community will rival in attractiveness and scope other multi-billion dollar, award-winning communities developed by the Ginn Company. Mr. Bobby Ginn presides over the Ginn Company. He has spent over 30 years building resort communities and says his core philosophy is to "under-promise and over-deliver." Ginn sur Mer is Bobby Ginn's dream. He says his inspiration is the Palace of Versailles in Paris, France, and his vision is to create a community that encompasses every possible amenity, luxury and activity imaginable. He wants Ginn sur Mer to be a place that guests will want to visit again and again. He believes it is destined to become not only the most distinguished Ginn resort but also the resort community by which all other vacation destinations around the world will be judged.